Say you got divorced, and you were given the exclusive right to decide on primary residence. Years pass, and life changes and you decide it is time to move. You did not have a geographic restriction in your decree so moving should not be a problem. When you tell your ex-spouse that you plan to move, he immediately decides to file a lawsuit against you to change custody in an attempt to become the sole managing conservator or the conservator with the exclusive right to decide on the primary residence of your child. In other words, he is trying to completely change the custody arrangement that you had at your divorce. To make matters even worse, he is trying to change your custody immediately, on temporary orders. He is not waiting until a final determination on the custody change. He wants the change of custody right now. Below is information on how to defend against his attempts to win the hearing. I do not suggest trying to do this without a lawyer. If you need a lawyer call us, we serve all of Texas. 1-888-646-5808. First, you need to pull the relevant law on this topic. 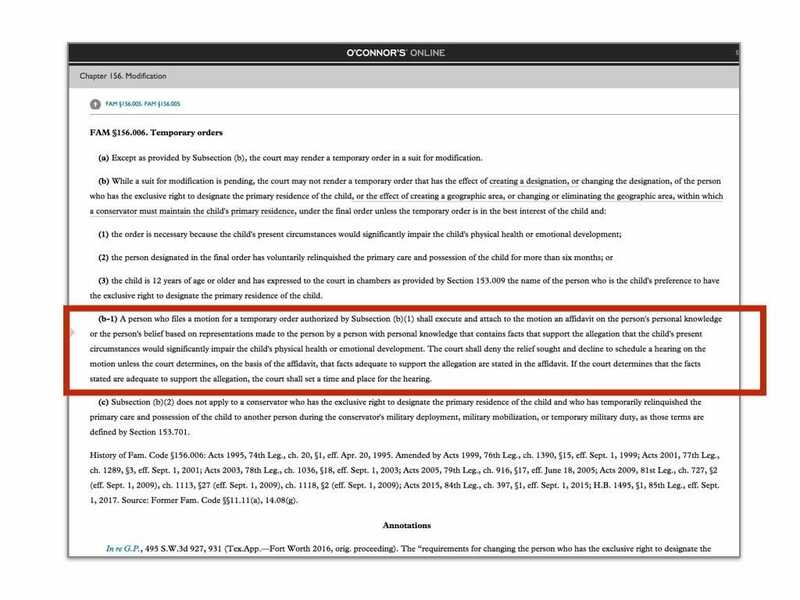 The law that governs how to change custody during temporary orders is Under the Texas Family Code 156.006(b)1. Here is the relevant law on whether conservatorship can be changed on temporary orders. You should present the part of the family code with red circles as below, to show the court how high the standard is to change custody on temporary orders. And, here is the relevant provision in regular text so that you can easily cut/paste into your own hearing materials. 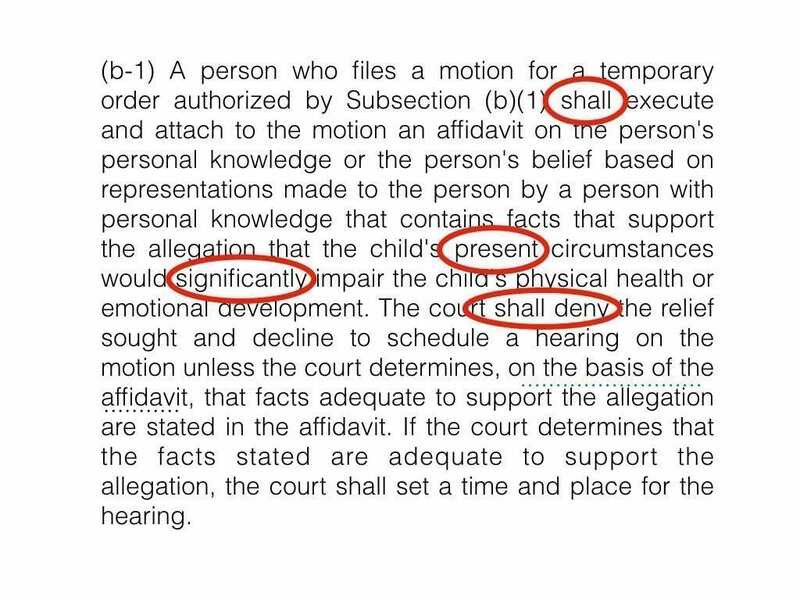 (b-1) A person who files a motion for a temporary order authorized by Subsection (b)(1) shall execute and attach to the motion an affidavit on the person’s personal knowledge or the person’s belief based on representations made to the person by a person with personal knowledge that contains facts that support the allegation that the child’s present circumstances would significantly impair the child’s physical health or emotional development. The court shall deny the relief sought and decline to schedule a hearing on the motion unless the court determines, on the basis of the affidavit, that facts adequate to support the allegation are stated in the affidavit. If the court determines that the facts stated are adequate to support the allegation, the court shall set a time and place for the hearing. The other side will be filing an affidavit that lists the reasons why a change of conservatorship is necessary on temporary orders. 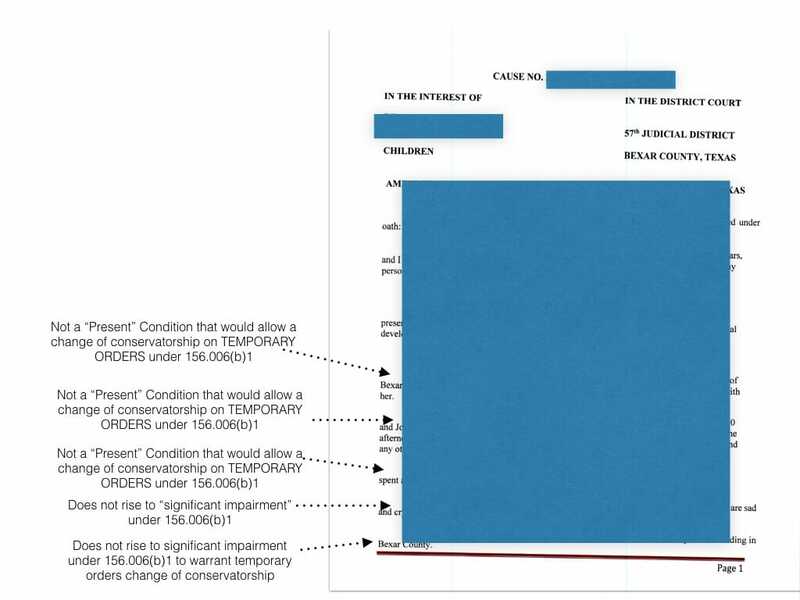 Your job is to create a visual aid, like below, that easily lets the court know that the affidavit is defective. The basic argument is that the children’s present circumstances will not significantly impair their emotional or physical well being. 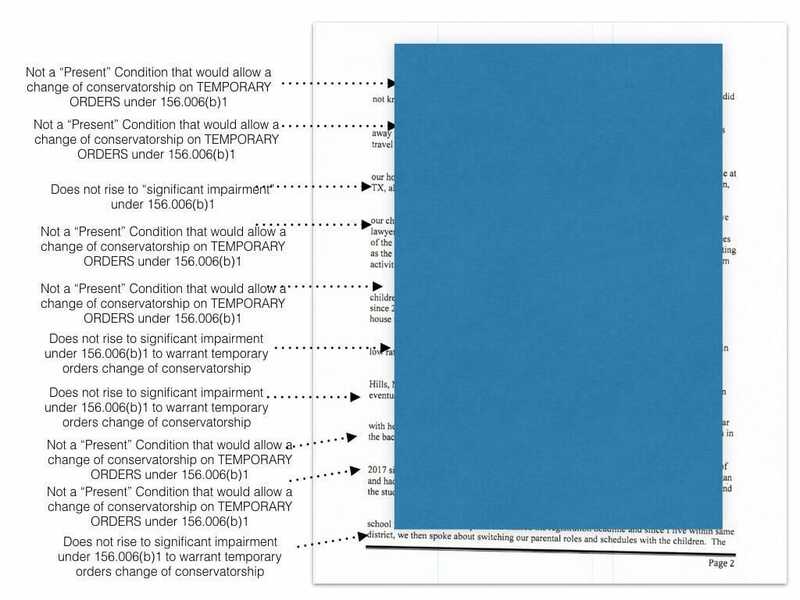 Here is the example (the big blue blocks are redacting a previoud aid we used in court to win won of these hearings). (please note that you will need powerpoint or keynote on your computer to move elements and make this a good working aid for your own use). You can have your visual aid as above printed, and when the Judge asks you for your argument, you can ask to approach the court and present your summary of response. 1. This is not in front of a jury, we are just presenting our arguments of what the law is on the topic, so evidence laws do not apply. 2. This is no different than presenting the court with a brief on a legal topic to assist the court. 3. Having a summary of this nature assist the court with judicial economy. Also, it is a good idea to print the CLE on signficant impairment from the Texas CLE library, highlight the cases and hand it to the court.